Want more high quality pasture? Get to know the biology of ryegrass and learn the finer points on how to grow it well. A perennial ryegrass pasture is made up of a population of individual plants, each plant is made up of a number of tillers. Each tiller can only maintain 3 live leaves. Each leaf will develop from the growing point at the base of the tiller. Ryegrass growing point is at the base of the plant where it is not damaged from grazing. Each tiller is capable of producing new or daughter tillers. These daughter tillers produce a new plant. Poa and Italian ryegrass are commonly mistaken for perennial ryegrass. Sunlight provides the basic food for ryegrass plants. Light energy is captured and used by leaves for photosynthesis, providing energy for plant growth. Grazing or harvesting pasture removes the ryegrass leaves and deprives the plant of light energy, the plants primary food source. However, ryegrass leaves have a limited lifespan regardless of grazing. Ryegrass is termed a ‘three leaf plant’ because each tiller generally sustains a maximum of three live leaves. There is always only one leaf growing in each tiller at any time, when the next leaf appears, the previous leaf has stopped growing. The time it takes for a tiller to produce a new leaf is largely dependent on temperature and moisture. Ryegrass grows best in the range 5°-18 °C. In mid-spring a new leaf may grow every 8 days while in mid-winter this time will increase significantly. Read more about leaf emergence rates here. A ryegrass tiller has a growing point from which new leaves grow. The growing point is found at the base of the tiller, close to the soil surface where it won’t be damaged during grazing, allowing the tiller to regrow. 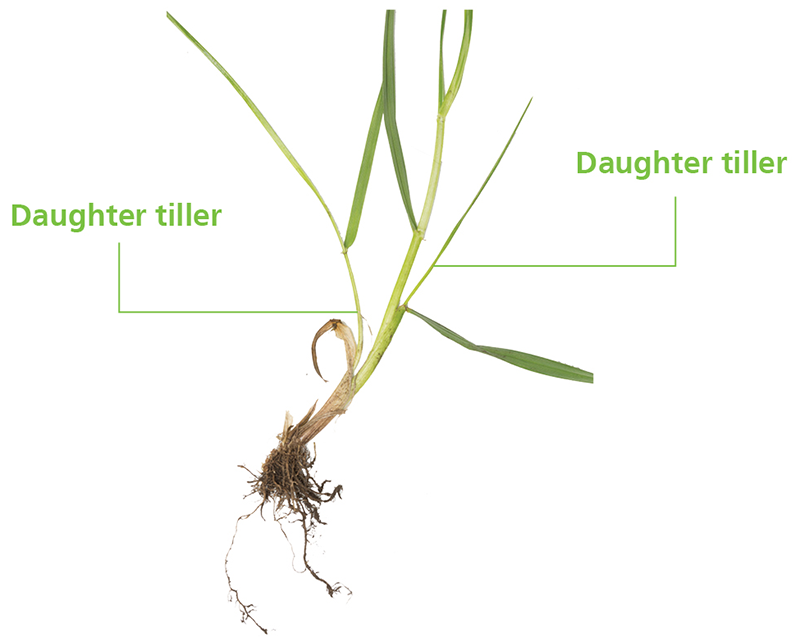 Perennial ryegrasses mainly reproduce through daughter tillers which become separated from the parent tiller and result in a new plant. Each tiller must leave behind one offspring. Few new ryegrass plants emerge in established pasture through seed germination under existing management. The perennial nature of ryegrass depends on tillering as a tiller only lives for one year. Spring and Autumn are key periods of tillering. Every time a new leaf is produced, a new tiller bud is produced. It stays dormant until the right conditions come for it to grow. Autumn tillers are the one that will grow your winter and summer pastures. The spring tillers will grow your spring, summer, and autumn pastures. What does this mean for grazing management and nutrition? The live ryegrass leaf is the nutritious and most easily digestible part of the plant. It is easily digested by the cow and can therefore sustain high levels of milk solids. For more information on the nutritional value of ryegrass see the Ryegrass as a feed section. The aim of grazing management is to optimize the amount of live leaf available to the cow by grazing at the 2.5 to 3 leaf stage. This maximises the capture of sunlight and optimizes pasture quality. Monitoring leaf stage is an effective indicator of when a paddock is ready to graze. For more information, leaf emergence rates see the Leaf stage page. Grazing management is key to the survival of daughter tillers. New daughter tillers born in spring need as much light as possible to develop. Daughter tillers will not survive weeks of darkness under high pasture covers. consistent grazing residuals of 1500-1600 kg DM/ha will enable sun light to reach the base of the pasture and help the survival of newly emerged daughter tillers. Grazing before the 2.5 leaves per tiller reduces yield and regrowth as it does not allow the plants reserves to be fully restored. Grazing too low can reduce regrowth as less leaf material is left to help regrowth and stem material is reduced. Graze to the same height each time e.g. if residual is set to 1500kgDM stick to it. Monitoring ryegrass leaf stage is an effective indicator of when a paddock is ready to graze. 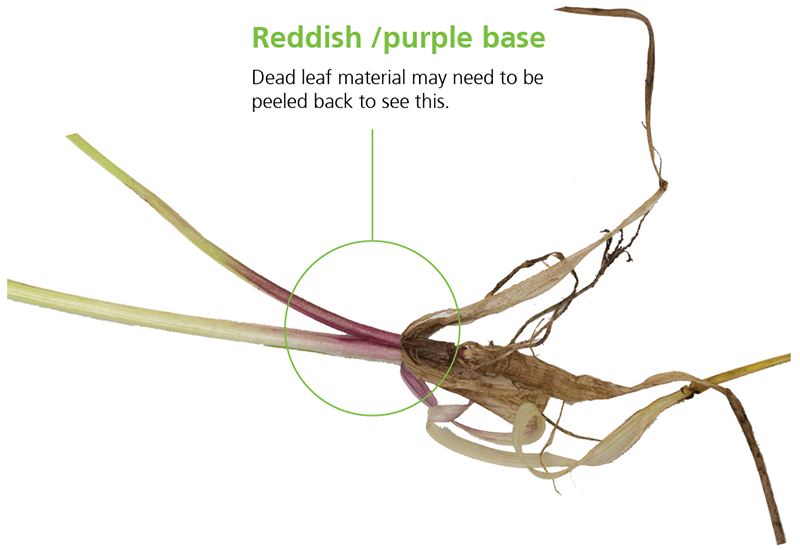 See how to identify leaf stages here. An in-paddock pocket guide to assessing post-grazing residuals, pre-grazing yields and leaf stage of perennial ryegrass. This issue of the Technical Series highlights the fundamentals of good grazing management.